We will take care of your Angus home’s roof replacement as quickly as possible without sacrificing quality. There are several things on your Angus, Ontario property that require regular maintenance to keep in top condition and prolong their life. Your home’s roof is one of those things, but regardless of how well you care for it, at some point, you will need roof replacement. What you don’t need is a roof replacement project that disrupts your life for weeks on end and leaves behind a mess. 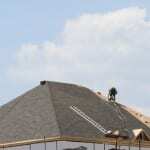 Neither of those will be the case when you hire our professionals at Slippery Slope Roofing. We put our experienced team on the job to take care of your roof replacement as quickly as possible without sacrificing quality. We also take care of cleaning up, so the only way you know you’ve had the roof replaced is that it looks fantastic. The way we are able to guarantee speed and efficiency is that we only work on one roof at a time, rather than split our team over two or more projects. You get our undivided attention, so you can count on having a new roof in far less time. We have more than 50 years of combined experience with roof replacement and repairs, so we are confident that you’ll appreciate the quality that we bring to the table. You can count on our commitment to quality work and your overall satisfaction because we never settle for mediocre in anything we do. If your roof is past retirement age or has been damaged in a storm, give us a call, and we’ll provide you with a free quote for repairs or full roof replacement depending on what our assessment determines is the best course of action. At Slippery Slope Roofing, we offer high-quality roof replacement services in Barrie, Orillia, Bradford, Alliston, Newmarket, Cookstown, Beeton, Innisfil, Angus, Collingwood, Wasaga Beach, Oro-Medonte, Midhurst, Midland, New Tecumseth, Clearview, Bradford, Essa, Stayner, Springwater, and surrounding areas of Ontario.